Check it out – remember that newborn cap my secret pal sent? You know, the only newborn-sized cap I have for the baby? Next up, my pal sent a ball of Cascade Fixation and the pattern!!!!! I’m so excited. After she told me she had made it out of Fixation, I had planned on buying some of it to try it out on my own. After all, elasticized yarn seems perfect for a kid’s hat. Thanks so much for the yarn and pattern, S. Pal!! It’s my favorite color too – lime green. Well, OK – I’ve noticed that while I haven’t had any pregnancy cravings, I’ve had color cravings! Isn’t that strange? So right now I’m on a green kick. Who knows what next week will be? I need buttons but even the ends are woven in. I usually ask Aaron to pick out the buttons because my taste in buttons has proved to be rotten. So it looks like we’re in for a trip to the button shop for both this sweater and the red one I posted yesterday. OK, the last one will take a while but I’m really missing the exercise at this point. So no real exercise before knitting, as the blog name implies. Just knitting. 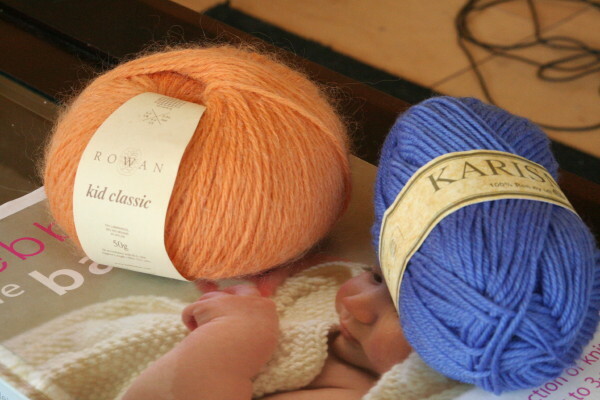 The top one is Rowan All Seasons Cotton, the bottom is Lion Brand Cotton Ease. Both are too big for a newborn’s head. Needless to say, this was part of my stash reduction binge last week when Aaron was out of town. 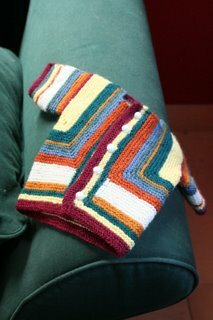 I made a few more but sent them to my Secret Pal for her charity knitting organization so no pictures of those. It really makes me mad that I am incapable of taking a good picture of this color yarn. It is a deep red like my favorite red chair background as seen in picture #5. Even when I tinker with the white balance, it looks washed out, burnt red or neon red. Anyway, I’m pretty happy with how it turned out. As it turns out, my button holes are too small for my preferred buttons so I’ll be searching for more buttons at the store in the next day or two. This has been finished for a few weeks now, I just haven’t pulled it out for a picture. It’s a simple clapotis knit in Cotton Plus by TLC. It’s a nice yarn in spite of its manufacturer. Really. And it’s machine washable/dryable cotton. This is the second clapotis I’ve made and I think that will be it for a while. I love the end result but I find the pattern terribly dull to knit. I’m taking a picture of this UFO in order to push myself to finishing it. I need those needles back, damn it! I started this last year for a baby that was due in February and ended up sending that baby a few sweaters because I could not face finishing this dreaded blanket. I have about 12″ done and I would like the blanket to be about 30″ long. 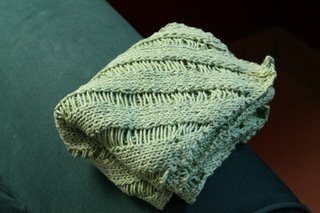 It is knit in softball cotton so I know it will shrink up a little upon washing. I have a huge cone of this yarn and my well-intentioned stash reducing idea at the time was to knit up the entire cone and then machine wash it. Yes, the blanket would shrink up but if it were knit extra long and then pre-shrunk, it could actually be a useful blanket since it wouldn’t need to be hand washed. 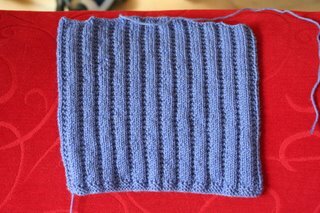 Well, in practice, I’ve discovered that this is a giant cone and seed stitch is really dull. If I had t.v., this would be a great t.v. project. I need to crash at a t.v.-watching friend’s house for a few days to get this puppy done!!! 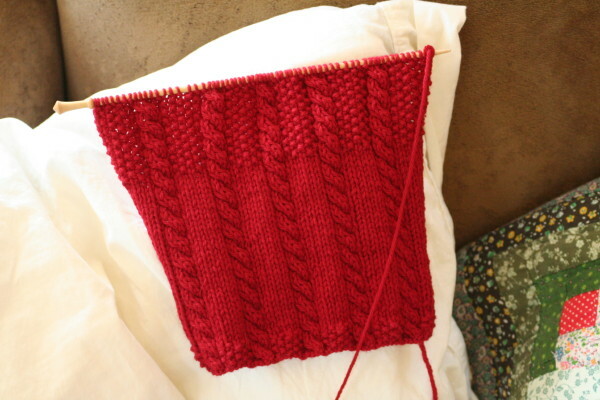 In any case, I am working a few rows every day with the hope that I’ll be able to finish it before my 100th birthday. Yes, it’s another baby sweater, although this one is of my own design using some of that Karisma Superwash wool from the sidewalk sale. This is the back. I have not yet decided if it will be a pullover or a cardigan. 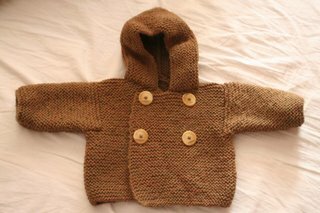 Practically all the baby things I make are cardigans so I think I ought to make a pullover. 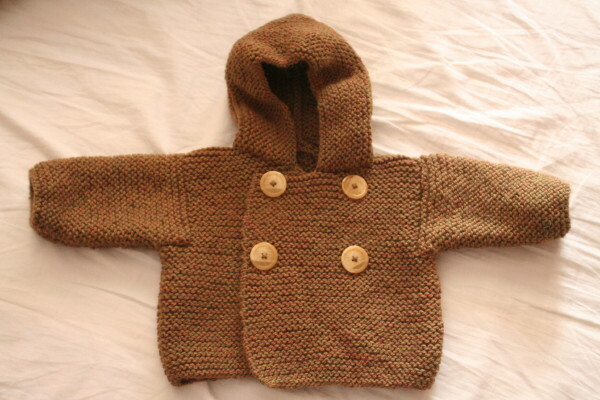 On the other hand, babies have awfully big heads, which is the reason behind making cardigans. We’ll see. Stay tuned. If the design turns out to be a good one, I might submit it to MagKnits, Knitty or Knit Picks. We’ll see. 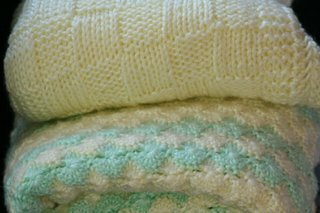 Finally, I will leave you with pictures of the wonderful baby sweater and blankets that the women from my knitting group gave me last weekend. As it turns out, they know how incapable I am of knitting baby blankets so they made two for me! 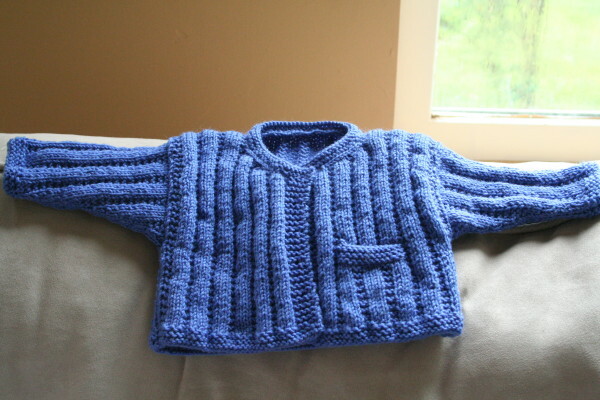 And one amazingly constructed baby sweater from an Elizabeth Zimmerman pattern. 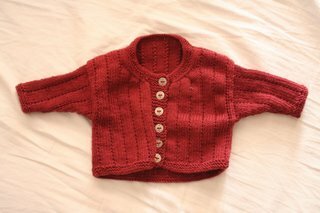 First, I finished the red sweater by sewing on some silver buttons. The front needs a warm iron – it looks crooked in front but it’s just because it’s been in a pile for a week. Next, the two finished hoodies: the green is knit in Cascade 220 and the brown is knit in Elann’s Sierra Aran. I never know which of the front sides gets the buttons so I usually just alternate. I love how the green came out. I admit that I like the brown one too, I just did not enjoy knitting with that color. I think it will look good on a baby. Fortunately, I only have one ball of that yarn left. I have no idea how to use 85 yds of it but it will sit in my stash for now. I don’t think I can face any more Sierra Aran jsut now. As you can see, I’ve altered the hoodie pattern between the brown version (original) and the green one. The green version is more trim and the fabric is stiffer because of the seed stitch. I also changed the kind and sequence of neckline decreases in order to make the hood/neckline join more seamless and less awkward. I also shortened the arms in the green version. The size is supposed to be 3-6 months and the sleeves on the brown version are as long as the sleeves on some of the 9-12 month clothing I have. Next, I’ve started another baby sweater (!) from Debbie Bliss’ The Baby Knits Book: the seed stitch & cabled jacket (picture below). 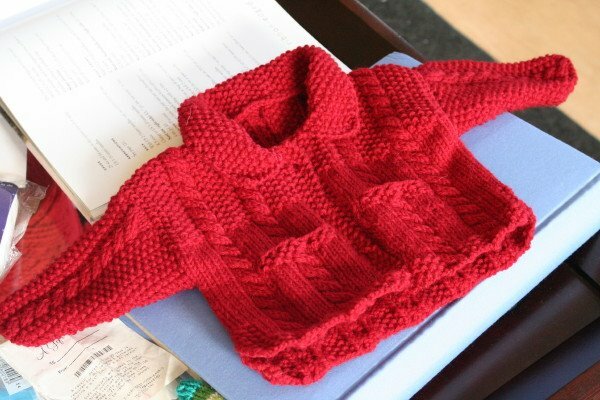 This is one of my favorite baby sweater patterns but it is way oversized. 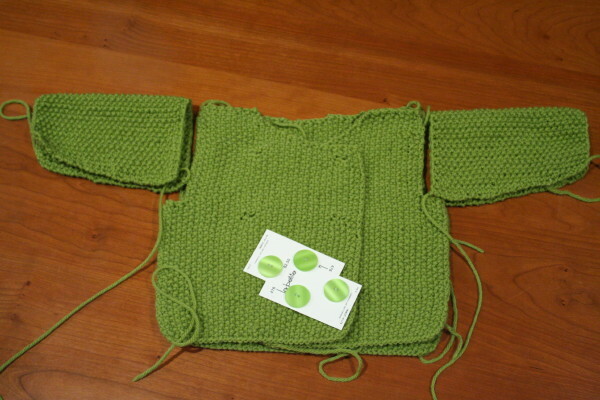 I’ve altered the pattern quite a bit because the 6-12 month size fit my 2-year old cousin. 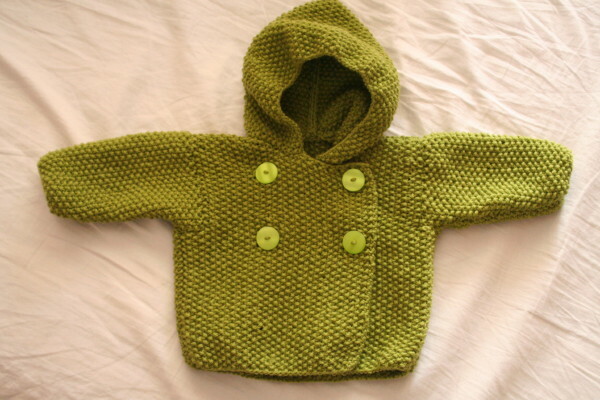 I used Phildar’s dimensions for 3-6 month size and reduced the smallest size of this pattern (the 6-12 month size). It is knit with Cascade 220. I chose this red to go with some wooden buttons. Of course, I forgot to take pictures of the buttons. NEXT TIME. Anyway, they’re adorable and I wanted to use them in a sweater. As much as I think they’d look best in another hoodie, I am *really* tired of working that pattern in spite of the alterations. Finally, I picked up new yarn today at the local sidewalk sale! Every year for the last three, my LYS has been selling Kid Classic on clearance at the sidewalk sale and I’ve bought 2 balls each summer. This summer’s color: cantaloupe. 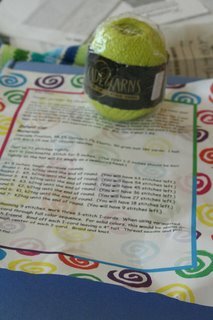 I also bought four balls of Dale Karisma (superwash wool) and some cotton yarn for my secret pal. The sidewalk sale is not really that impressive of a sale but it makes yarn from LYS only a little bit more expensive than Knit Picks if you consider shipping costs. Every year, I am always amazed by the crowd of cranky knitters lacking social skills who turn out to buy garbage bags full of yarn. It’s as if these people come out of their hiding places only once a year to buy fiber. Yes, that’s awfully mean and critical but I have little patience for people who aggressively shop for yarn and argue about fiber with total strangers. When you are that rude and obsessive about your craft, it is time to 1) find a new hobby, 2) reacquaint yourself with the sun, and/or 3)return to civilization. More on the cable & seed stitch jacket later this weekend. I also have made some progress on other UFOs but I will not post those until they are DONE. I need a reason to finish them. The camera is on vacation in San Francisco this weekend so I only have one picture for you. I’ve finished up a lot of UFOs this week but alas! I have no proof. Aaron comes home on Monday night so I’ll post lots of pictures on Tuesday. 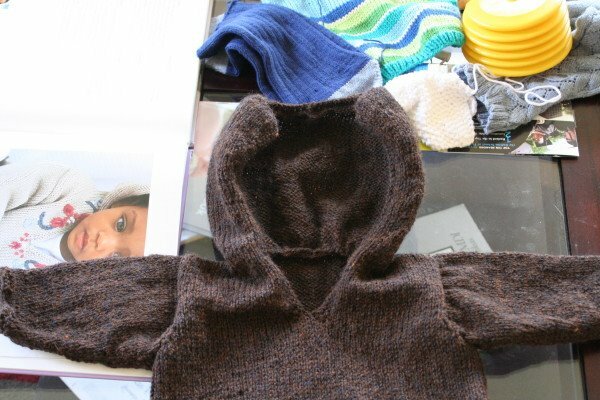 For starters, I was working on finishing the brownish green baby hoodie when I went to my knitting group last week but I suddenly RAN OUT OF YARN! Eek! I had more at home but what was a knitter to do? With the LYS only a few doors down from the cafe, I bought yarn! I only had the hoodie pattern with me so I started another one. I’ve actually pulled out the graph paper on this project and altered the pattern quite a bit. I think by the next time, I’ll have an entirely new pattern!!! 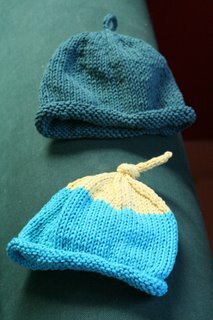 I also tried to get rid of some small partial skeins of Cotton-Ease so I’ve made a few baby hats. I wish I had a good pattern for baby hats. Mine are all Debbie Bliss and, as I’ve said before on this blog, her patterns are always too big. 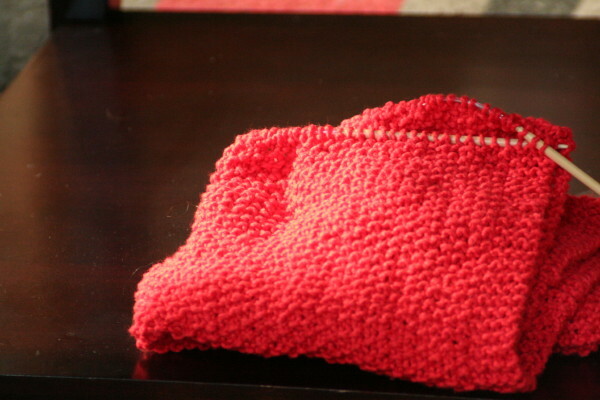 When I knit a hat for a newborn, I don’t want it to be baggy until the kid reaches 6 mos. The only knit hat that I have for this baby that looks like it will fit a newborn is the really cool one from my Secret Pal. I’m going to have to buy some Cascade Fixation. The stretchiness must be the key to hats that fit. Any opinions out there? I’d love to hear them! FYI: Debbie Bliss’ Hooded Kaftan from Special Knits is the WORST pattern ever. I like DB’s style and I don’t mind that her garments knit up way too big and she never offers schematics. I can forgive her for that but I cannot forgive her for writing a really crappy pattern. Before I start on one of her projects, I google the pattern and check the errata. One forum on Knitters’ Review noted there were some problems with attaching the hood on this sweater so I was extra careful to avoid the pitfalls other knitters mentioned. K4, m1, knit to last 5 stitches, m1, K4. Work 5 rows straight (in st stitch). Repeat these 6 rows 9 times more. Bind off. That’s it. That’s the hood. that’s a freaking trapezoid. That’s not a hood. I thought the edging might pull the fabric into a hood shape. Nope. It’s still a trapezoid. I intend to email DB with my criticism but I doubt I’ll take the hood out. I might try to sew the trapezoid together to force a hood out of it. I don’t know how well that will work but we’ll see. Grr.